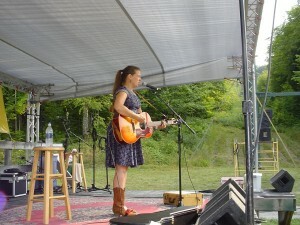 Brianna Lane made a rare second day performance on the Singing Hills stage. While it is not unusual for an artist to appear on both stages over the PMMF weekend, Lane was the first artist I can remember playing the Singing Hills Stage twice. In the top half of the inning (Friday) at the Porcupine Mountains Music Festival #11, every band that played the Singing Hills stage hit a homerun and hundreds of fans made the walk up the hill from the Peace Hill stage set up in front of the chalet. By the time I arrived on Saturday, the Armadillo Sound crew had the stage prepped and were waiting for our first act, the DuPont Brothers. Sam and Zach DuPont really are brothers and they currently work out of their home base in Burlington, Vermont. They were two thirds of the way through a midwest tour and planned to swing through lower Michigan on the way back to Vermont. They spent some time tuning and adjusting the capos on their guitars but the short wait between songs was worth it. Their guitar parts complimented each other very well and as singing brothers go, they also had a fine vocal chemistry. Easy banter with the audience such as, “ This is a musical massage to start your day off easy” made them a fun opener for Saturday’s schedule. They seemed pleased when I described their set as ‘very Everly Brothers’. 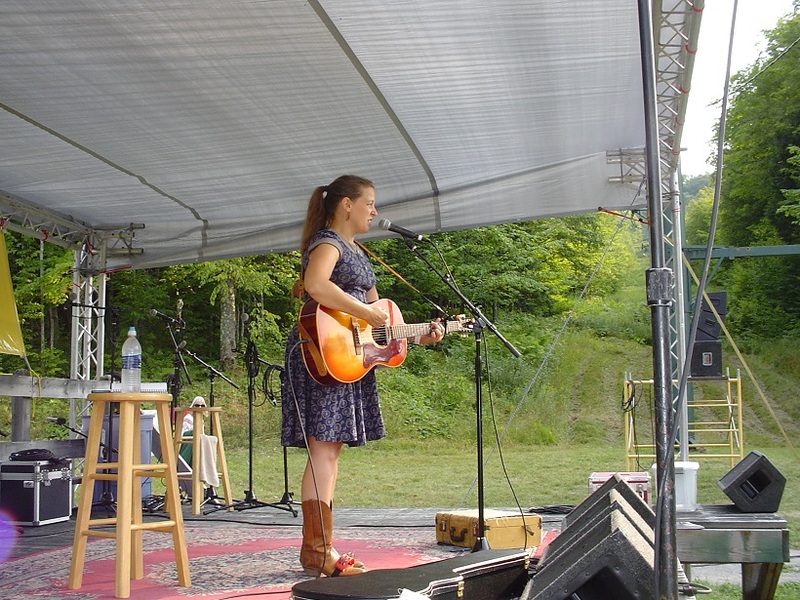 The second act of the day was singer/songwriter Brianna Lane returning for a second go at the Singing Hills stage. She mused that, “maybe I can play the same three songs I started with yesterday until the crowd wanders up from hearing The Ragbirds at the other stage.” She ended up with an even larger audience on Saturday and she again reminded everyone that Ana Egge would be up later and no one would want to miss her. I noticed the bass player from Scottie Miller’s band was on hand for Jack Klatt’s set. He confirmed my suspicions about Miller using a rotating stable of musicians in his own band when Jack said, “yeah, he is my bass player but he is playing with Scottie Miller this weekend.” Whether he was covering other writer’s songs or his his own compositions, Klatt played, sang and conversed with the crowd in a manner that can only be described as ‘effortlessly’. Even when Vox Vidorra cranked up the volume on the other stage, Klatt kept his audience rooted to the ground until he was done. The three man group Whistle Stop Revue came up next and we had plenty of time to talk about their home region of Port Huron, MI and their gigging schedule. Guitarist Rick mentioned that he had spent time in Trenary, MI as his grandmother had taught school there for 42 years. They were a friendly, enthusiastic group and after over doing Jack Klatt’s intro, I had mentally worked up a less wordy introduction for them. If you have wondered at all why I started comparing PMMF #11 to a baseball scorecard, it is because I made the Bill Buckner/Steve Bartman error of all errors when I finally did their introduction: “Would you please welcome from the beautiful western shore of Lake Huron, The Ragbirds!”. I turned around and the three guys in the band resembled three owls suddenly caught in car headlights. Rick said, “Ah, we are The Whistle Stop Revue – but we are good friends with the Ragbirds.” I am sure I looked just as surprised to them as they did to me. I thoroughly apologized to the band when their set was done and they were cool about it but I was still mortified. Having MCed at PMMF for ten years and dozens of bands, I have no idea where I got the wrong name from. The Ragbirds were not scheduled for the Singing Hills stage and the closest I came to them was seeing their name on a bass drum head as I cut through the chalet on the way to the hill on Saturday morning. It was just one of those mental lapses that I can’t explain but perhaps it was a little Godsmack reminding me to “pay attention, stupid.” On the way to my car after my shift, I ran into Rick (Whistle Stop Revue’s guitar player) in the chalet, shook his hand and said, “Hey, aren’t you in the Ragbirds?” and he replied with a chuckle, “Yeah, I hear we are really good.” I take back my comment about it being a Bill Buckner/Steve Bartman level error (and I won’t even bring up Steve Harvey): it wasn’t life altering because my error will eventually be forgotten and I won’t receive any death threats from my faux paus. The Whistle Stop Revue did a great set, by the way, and I especially liked their version of the Grateful Dead’s Friend of the Devil. Halfway through the Whistle Stop Revue’s set, the much anticipated Ana Egge arrived with her two backup musicians. Hearing that they had an hour and fifteen minutes before showtime, they wandered down hill toward the Peace Hill stage. I had assured Ana that there would be time for a sound check and assumed they would keep an eye on the clock. With 30 minutes to go before showtime, Marty and Mary started getting a little nervous when the band hadn’t returned for final set up. Eventually they did return and we got things prepped in time for them to run through several tunes before showtime. They then retired behind the stage and I plunked down on a stool at the back of the stage with ten minutes to practice saying ‘Ana Egge’ in light of my previous goof. With her reputation preceding her, I pointed out to the crowd that this was a highly anticipated set, concluding with, “please welcome to our stage Ana Legge, I mean Egge.” I thought Marty was going to fall off of his chair and when I turned, Ana looked a little bewildered until I said, “yes, I did that on purpose for Marty.” For the record, I made sure I got her name right for the walk off announcements. Brianna Lane and the Wild Ponies were absolutely right about the quality of her songs and performance. Backed by cello and violin, her songs were memorable and haunting. Her final song, Rock On left everyone in kind of a stunned silence until the applause started. People checked their schedule to see when she would be appearing on the Peace Hill stage on Sunday. More home runs. Hundreds of people walking up the hill to the Singing Stage. One error. All in all, it was another enjoyable two days spent at the 11th Annual Porcupine Mountain Music Festival. I am looking forward to spinning PMMF artist tunes until PMMF #12 next August. Tune in to 88.5 FM and you can relieve PMMF #11 on Your Sound Choice, WOAS-FM. The top piece video features Jack Klatt of Minneapolis, walked the line between country and folk as the first purveyor of ‘hokum blues’ to grace the Singing Hill Stage.